This weekend, from Friday, September 14 to Sunday, September 16, features dOGUMENTA, Roaring Nights at the LA Zoo, a Vintage Vibe Festival, the Los Angeles Taco Takeover, Metro’s Pride of the Valley, and MUCH more. 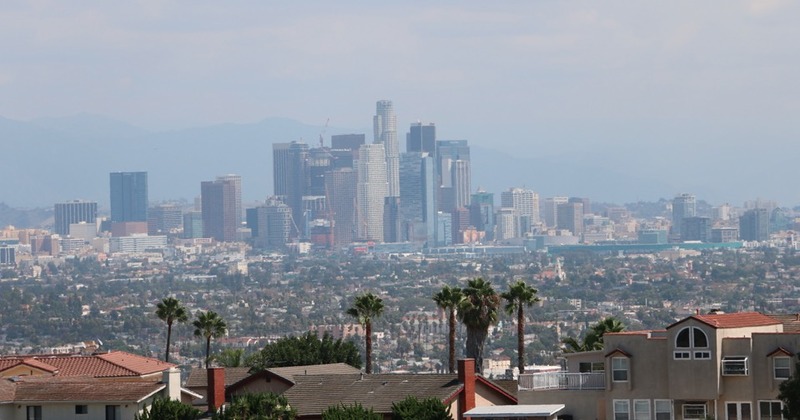 A view of downtown from Kenneth Hahn Recreational Area. Credit: Brian Champlin / We Like L.A.
3. Alpine Village Oktoberfest celebrates 50 years! The fun kicks off this Friday with traditional Bavarian fun like Oom Pah Pah party bands, German fare, and delicious cold German beers. Oktoberfest runs Fridays and Saturdays September 7 through October 27. 4. Get ready to scream, be amazed or simply turn away because Son of Monsterpalooza (Sep 14-16) is coming just in time for Halloween with makeup demos, panels, and more. 5. The legendary Queen Mary welcomes master magician and apparitionist, Aiden Sinclair, aboard the ocean liner for ‘Illusions of the Passed; Legends of the Queen Mary, A Theatrical Séance!’ where guests will travel back in time to encounter the ghosts who reside on the historic ship. 6. Come watch film composer Rolfe Kent and his band perform outdoors at the Will Geer Theatricum Botanicum in Topanga Canyon during “The Concert Goes Awry.” He and his band will create live melodies and harmonies that will be looped and played together eventually into a beautiful swirl of vocals. 7. PaleyFest, at the Paley Center for Media in Beverly Hills, wraps up this weekend. 8. Westfield Topanga Restaurant Week comes to a close this Sunday. The dining event takes place across the Westfield Topanga properties, highlighting a diverse selection of choices and flavors, from fine dining steakhouses to good old Southern BBQ. The best part? Guests can expect savings of up to 20% off on uniquely crafted prix-fixe menus. 10. Ánimo Productions and LA Plaza de Cultura y Artes present the latest installment of Boleros De Noche concert series featuring bolero music under the stars in historic Los Angeles. 11. 260LA will host french women brand Maje sample sale from September 10 through September 16 in their Beverly Hills space. 12. Rooftop Cinema Club returns to the rooftops of LEVEL in DTLA and NeueHouse in Hollywood with multiple screenings this week that include Black Panther, Top Gun and more. 17. The 3rd annual Westchester Arts & Music (WAM) Block Party will feature succulent planting, garden tours, face painting, and a petting zoo for FREE. 18. Check out Cine Sin Frontera, a selection of highlights from the Morelia International Film Festival at the Vincent Price Art Museum with music and more this Saturday. 20. The Los Angeles Cactus & Succulent Society will host their annual Fall Cactus & Succulent Sale this Saturday in Encino at the Sepulveda Garden Center. Peruse and purchase unique and unusual cactus and succulents for 20 vendors offeering special plants, handmade pottery, and art. Proceeds from the sale will go towards helping grow and maintain the public cactus garden at the Sepulveda Garden Center. 22. Craft Beer LB Fest is a family-friendly fest exclusively featuring local breweries, food, and artists. 23. BATMAN DAY is this Saturday and takes place across many participating comic shops, libraries and bookstores. Fans will receive free comic books, giveaways and a free online activity kit. DC artists will also be hosting special fan signings at select locations. 27. Modern Southwestern eatery Panxa Cocina in Long Beach just rolled out an impressive Hatch Chile Menu for the month of September. In addition to the hatch menu, on September 15-16 guests can experience a hatch chile roasting and pick up some for your home! 29.. The Silverlake Flea-Night Market taking place every Saturday from 5-10 p.m. all summer long features a plethora of local, independent sellers that offer vintage clothing, art, rare vinyl, crafts, and much more. 30. Will Geer’s Theatricum Botanicum outdoor theater presents Shakespeare’s Coriolanus this Saturday. 31. HUSHfest closes out their popular Silent Disco series at the Santa Monica Pier this Saturday with Hip Hop Battle: West Coast vs East Coast vs Dirty South. 32. Patti Smith, Karen O, Flea, Tony Hawk, and more will take part in Pathway to Paris, a concert uniting musicians, artists, policymakers, and more to spread awareness of climate change. Taking place at the Theatre at Ace Hotel. 33. KCRW’s World Festival returns to the Hollywood Bowl with The War on Drugs and Alvvays performing this Sunday. 35. KCRW presents Gustavo’s Great Tortilla Tournament with Good Food’s Evan Kleiman, and the author of Taco USA, Gustavo Arellano. Help them crown the best flour and corn tortillas in Greater L.A. this Sunday at the LA River Center & Gardens. There will be tortilla tastings, tortilla art making, food vendors, margarita and michelada bars, live demos, games, and much more. Free admission but rsvp is required. 39. E.P. & L.P. in West Hollywood continues their stylish cinema series Melrose Rooftop Theatre with a screening of The Blues Brothers this week. 40. There’s two new hyper-realistic VR experience at The VOID in Glendale a Ghostbusters themed experience and a scarier Nicodemus: Demon of Evanishment experience. Experiences run on different days, be sure to check their schedule. 41. Free museum days: Museum of Latin American Art is free and Craft and Folk Art Museum is pay what you can on Sunday. 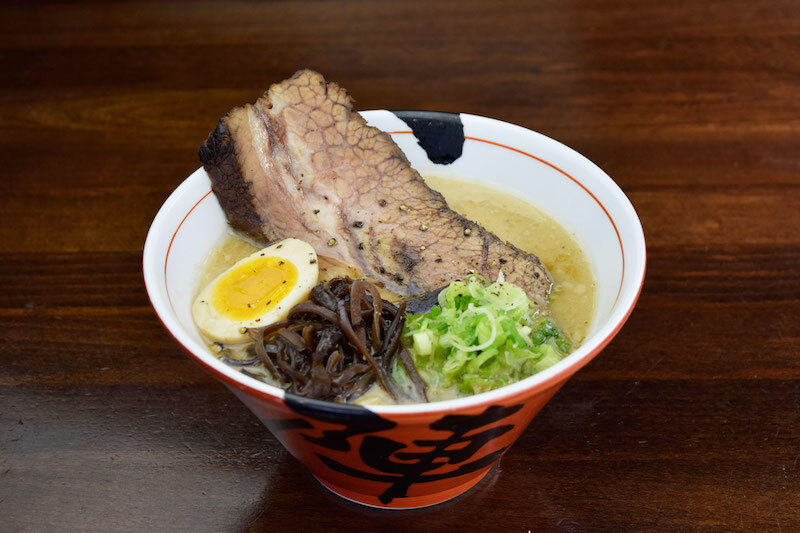 JINYA Ramen Bar recently rolled out a limited-time bowl called the “Goku Midnight Cowboy” featuring a slab of braised beef brisket in Tonkotsu ramen topped with bean sprouts, green onion, kikurage, seasoned egg, and thick ramen noodles. Created by Chef and Founder of JINYA, Tomonori Takahashi, the dish combines flavors of Southern barbecue with Japan’s famous ramen. The “Goku Midnight Cowboy” ramen bowl is priced at $22 and will be available through November 30 at all Los Angeles locations of JINYA Ramen. Want to get our to-do lists straight to your inbox every week? Sign up for our email program.